Wicked Jackpots is the top casino that never sleeps and where the party never ends. Now you can party all night and day with hundreds of exciting games, including Blackjack, Roulette, online slots, Live Casino games, and more. Those games come with wicked jackpots to enjoy wicked time! 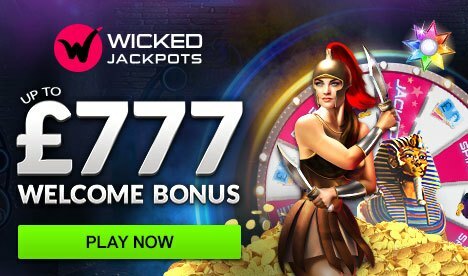 All new players at Wicked Jackpots get a wicked welcome with a 77% match bonus on their initial deposit! This fantastic sign up offer will give you up to £777 in bonus cash for an excellent headstart playing your fave casino games. The fun continues for all Wicked Jackpots members with loads of opportunities to increase your wins! Pandora’s Box happens every weekend and gives you a 40%-100% mystery bonus for up to £250 extra! Play for a chance to spin the Wicked Wheel, a hot new spin the wheel bonus! Simply play to fill up the progress bar and earn a spin! Watch the wheel spin and land on one of 12 guaranteed prizes such as FREE Spins, Extra Coins, and bonus cash goodies! Make sure to join the Battle of the Slots, a weekly competition where 1,000 Free Spins are given away. And don’t forget to play the Game of the Week for a chance to grab a slice of the prize- 3,500 Coins! Plus, all players that subscribe to our special email and SMS bonus list will enjoy heaps of extra bonuses, free spins, and giveaways! Find some of the best games to have a blast at Wicked Jackpots. You may select from over 400 slots, blackjack, roulette, and live casino games. You can expect a top online gaming experience on the site with countless games from leading game providers in the industry. Spin on some of the most popular online casino slots at the casino site, such as Fluffy Favourites, Starburst, and Da Vinci Diamonds. There are also various progressive slots on the site such as Nightmare on Elm Street, Piggy Payout, and Temple of Isis. The Table and Card Games section has numerous entertaining classic and live casino games with extra chances to win! Make use of the Promo Codes available on the cashier to grab some extra casino bonus when making a deposit! For more info about how the latest bonus offers, you can just visit the casino site or head to its Facebook or Twitter page, or contact the site via live help or email. The leading software used to power Wicked Jackpot is Dragonfish. This means that you can expect to have one of the best gaming experience. All the exciting games available on the site are offered by top game providers such as Microgaming, WMS, NetEnt, Eyecon, and many more. The casino site offers a wide range of safe and secure payment options that you can trust. These include all major credit cards such as MasterCard and Visa, Paysafecard, PayPal, and EntroPay. For any queries that you may have about your payments or withdrawal, you can get in touch with the friendly customer support team that are available everyday. What’s great on the site is the fact that you can party and enjoy your favourite casino games while being on the go. So, you can win some serious cash anywhere and anytime on your tablet or smartphone. Join Wicked Jackpots now to have a chance to win some serious cash!